Background: India is witnessing new upturn in relation with USA on strategic and defence ties, but it continues to have trade disputes with it at WTO. This article highlights the background of recent trade disputes. India and USA have fought over bilateral and multilateral for as on issues of trade, climate change and intellectual property rights. An outgoing US ambassador to India urged both sides to convene a “Track 1.5 event” when trade relations were plummeting in 2014. Following are some issues that have strained India-USA trade relations. India has initiated a WTO dispute proceeding against the USA regarding measures imposing increased fees on certain applicants for H1-B and L1 categories of visas. India argued that visa fee increase is “discriminatory” against Indian firms as these (H-1B and L-1) are the same categories that are most extensively used by Indian service suppliers, especially in the information technology sector. India has categorically stated that using the visa fee hike to raise revenue (in this case, to finance a biometric tracking system and healthcare requirements of the 9/11 terror attack victims) would open Pandora’s Box. It warned USA that this could lead to other nations deliberately raising customs duties on goods to increase revenue for their domestic programmes. Such ‘protectionist’ actions (of hikes in visa fees and duties) will in turn further hurt global trade which is already going through major slowdown. USA has denied of visa hike being discriminative against Indian information technology companies as stated that it was general in nature. However, Indian companies will be hit as the increased fee is applicable only on companies that employ more than 50 foreigners, or which have more foreigners than locals working for them. Indian IT industry body Nasscom said the financial implications of the visa fee increase for the technology sector would be around $400 million a year. Indian move is unusual at the WTO, where most disputes involve goods, tariffs and restrictions, not services. In 2010, Jawaharlal Nehru National Solar Mission was launched which had a target of installing 100 GW of solar power by 2022. Under domestic content requirements (DCR) norm of programme, the Government was willing to enter into long-term purchase agreements at an agreed price with solar power producers, provided they use domestically produced solar cells and modules. It needs to build robust domestic industries for manufacturing solar cells, solar modules and other products for renewable energy. India invoked UNFCCC and argued that it had to take steps to achieve energy security, mitigate climate change, and achieve sustainable development. (UNFCCC invocation provides an exception under WTO rules). Also, to ensure adequate reserve of domestic manufacturing capacity for solar cells and modules in case of disruption in supply of foreign cells and modules. In September 2014, India refrained from imposing anti-dumping duties on cheap solar panels imported from the US and China (despite it being recommended by Directorate General of Anti-Dumping) on basis that there wasn’t enough domestic manufacturing capability. Thus, India expected that if it did not impose anti-dumping duties on cheap solar panels, USA would withdraw the 2013 case. But the expected did not happen. WTO ruling: Came in favour of USA by stating that DCR is inconsistent with national treatment obligations. Thus, it became visible that WTO panel gave precedence to the WTO rules over international obligations on climate change. 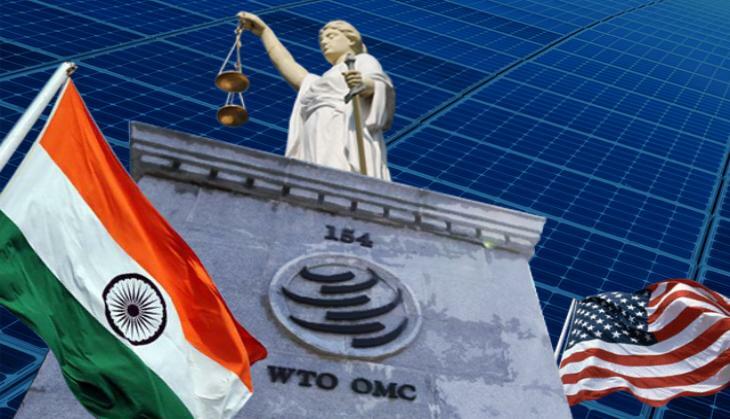 India has challenged WTO panel ruling and is also exploring the option of filing a counter complaint against USA, with several states in USA such as Michigan, Texas and California having also reportedly been accused of employing mandatory local content requirements in the renewable energies sector. India had banned poultry import from USA since 2007 by invoking SPS (Sanitary and Phytosanitary Measures) agreement clause of WTO. Basis: as a precautionary measure to prevent outbreaks of Avian Influenza (AI) and bird flu fears. They were not based on scientific risk assessment. USA is now seeking trade sanctions against India and also launch the claim for compensation. United States Trade Representative’s (USTR) Special 301 Report 2016- has kept India on a priority watch list. Special 301 report is annual assessment of the state of intellectual property (IP) rights in other countries. Priority watch list= Countries judged by USTR as having “serious intellectual property rights deficiencies” that require increased USTR attention. India has repeatedly asserted that its IP laws are compliant with standards mandated by the WTO’s Trade Related Intellectual Property Rights (TRIPS). However, India has resisted ‘TRIPS Plus’ requirements in international trade deals. TRIPS Plus: Multilateral trade deals like RCEP and TPP are seeking ‘TRIPS Plus’ standards which would restrict generics drugs exports from India and prevent Indian companies from obtaining the latest technology at affordable prices from abroad. It was observed that various ministries (Ministry of commerce, Ministry of New and Renewable Energy, Ministry of Animal Husbandry) handling WTO disputes did not work as a team and hence failed to put a strong case at WTO. Thus, trade disputes have to be taken ownership of and handled jointly by the responsible Ministries and departments and not as individual entities. There is a need to have sufficient pool of Indian trade law experts to represent India at WTO Dispute Settlement Body. Though relations of top leadership are encouraging, India should continue to pursue its stand to upkeep its national interest and also defend its domestic rights.